The Trojans were basically inept against Stanford and while the Utes are not as good as the Cardinal, on the road I just don't see them pulling the upset. South Florida is a solid club but there is no way that Florida State does not come back strong this week. It was a wild contest at home against the Crimson Tide but the Rebels ultimately came up short. I do think they'll bounce back again at home against a team I think they're better than in Georgia. Wisconsin had themselves a great upset win over LSU in the opener but haven't really played anybody since (and really struggled with Georgia State this past weekend). Meanwhile, Michigan State just had themselves a statement win in South Bend. Give me Sparty. An upset would be fun here but the Nittany Lions just have not looked that good this year. Will the Cougars play a game that is not a nailbiter? This will be a neutral site but not really that neutral and while BYU could use a break, I like the Mountaineers here. Florida hasn't played anybody and have kicked the crap out of all opponents. Tennessee has played a tougher schedule and could easily be 0-3. Even at home, I like the Gators. Both teams are quality in my humble opinion but I think the superior offense of the Tar Heels will be the difference. Gus Malzahn could really use an upset here but I just don't see it. Offense, offense and more offense. Oklahoma State really should be 3-0 but we don't need to re-litigate the Central Michigan game. Baylor hasn't played anybody and I think they're vulnerable to an upset. The Cardinal looked good against Kansas State and looked pretty good at USC, both contests at home. This is a key road contest in Pasadena. UCLA just hasn't looked as solid as I thought they were going to be this season so give me Christian McCaffrey and his friends here. Hey, more neutral site games! Both teams are good and have looked pretty good this year with a pair of key wins (A&M over UCLA at home and Arkansas over TCU). The Aggies, though, have been better defensively than I thought they would be and thus I like them here. 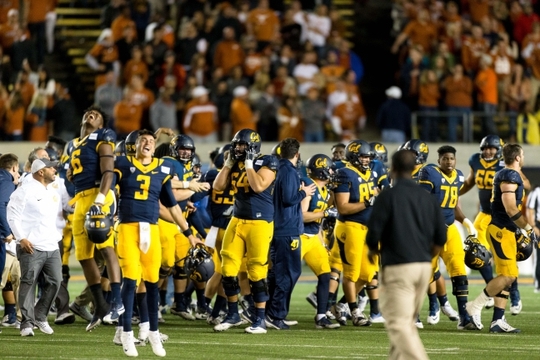 How good are the Golden Bears? They looked great against Texas in pulling the upset at home but I'm still not all the way there. I think they'll fall against an explosive ASU club. Washington should win this game but they better not overlook our good friend RichRod.